The Estate Series 60-inch rake from Woods Equipment Company is effective for light landscaping work and general maintenance. 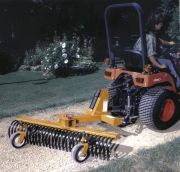 The compact rake features heat-treated, high carbon steel tines for handling gravel, dirt or sand and provides a smooth, even grade. An optional gauge wheel offers greater control for an even finer finish grade. This model may be angled 30 degrees and pivots 360 degrees for added versatility. 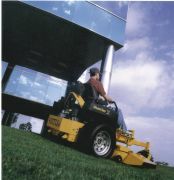 The Trailette® by Minuteman Parker® is a durable, professional, tow-behind lawn sweeper. 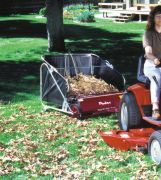 It has a 36-inch sweeping path and E-Z® dump basket that makes emptying fast, easy and versatile. Its large-capacity, mildew- and rot-resistant basket collects 10 cubic feet of material. The Trailette® has eight steel-backed brushes with polypropylene bristles that contain sunlight-tolerant inhibitors. The brushes are mounted in four staggered rows to provide more sweeping action and to propel debris toward the back of the basket. Cast-iron wheels add weight for efficient sweeping and easier maneuverability. H. Barber & Sons, Inc. offers the Sand Man, a compact, walk-behind sand cleaner that easily and efficiently removes debris from beaches, playgrounds, volleyball courts, golf bunkers, infields and horse tracks. Debris such as stones, wood, broken glass, cigarette ends and animals droppings are removed for a cleaner, safer and more enjoyable recreation area. The highly maneuverable Sand Man has an impressive working speed of up to 3.4 miles per hour. It also travels easily and quickly when not cleaning for use in other areas. For longer-distance travel, its compact size allows easy transport in the bed of a pickup truck. 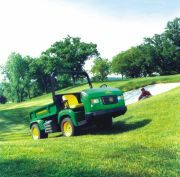 The John Deere ProGator utility vehicle combines modern styling and operator-friendly features with rugged durability and sheer power. Available in 23.5-horsepower diesel and 26-horsepower gas versions, the ProGator has a five-speed, fully synchronized transmission that let's you go without stopping to change gears. Hydrostatic steering allows for precision controls and a tight-turning radius. With a 2,650-pound payload capacity and a hydraulic lift, the ProGator can handle heavy loads with ease. Extra strength comes from the one-piece axle supporting the rear wheels, allowing for more capacity and providing more stability. The new 101-D dual-side gutter broom from Mad Vac has a 48-inch head for increased ground coverage in a single pass. The new feature was designed to allow the brushes to be hydralically raised and lowered with the vacuum head for on-the-fly-engagement and for down pressure adjustment. The broom is easily mounted on either side of the vacuum head for easy access to litter collection and for bringing litter easily into the nozzle. Mad Vac's self-compacting vacuum system can efficiently pick up glass, metal, bottles, cans, cardboard, plastic or any debris that's wet or dry which fits into its hose. Loegering's new line of snow blowers maximizes capacity and throwing distance and eliminates snow-removal hassles. The innovative new attachments outperform many others by throwing wet, heavy snow far and fast. 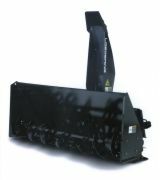 Five snow blower models are available including the newest model size, the Loegering LSB48 with an intake width of 48 inches. The LSB67 has an intake width of 67 inches; LSB73, 73 inches; and the LSB85 and LSB85 Extreme, 85 inches. The blowers draw in only as much snow as they can throw, and a reversible auger and impeller design expels obstructions without requiring operators to exit the loader. The new Kohler Aegis liquid-cooled engine powers the Grasshopper Model 725A. The G2 transmissions provide dynamic power for any application. The operator station offers all-day comfort, with all controls within easy reach. The unit accepts 48-, 52-, 61- or 72-inch DuraMax DecksTM that allow operators to mulch, collect or discharge clippings using the same deck. The QuikConverterTM Implement System allows for changing deck sizes or adding a complete line of year-round implements in minutes. PowerVacTM Collection Systems are available from 8- to 25-cubic feet. New features on the Hustler ZTM 2003 models include a lifetime warranty on both tractor frame and leading edge of the deck. New stainless-steel, high-pressure hydraulic lines have Parker Seal-LokTM O-Ring Face Seal fittings for no leaking. It also has a standard heavy-duty air cleaner, twin-lever steering with automatic park brake system, and a simple foot-operated deck-lift system. Only 75 inches long, it is the shortest Z in the 60-inch class. It comes with a fuel-efficient 24-horsepower Honda or 23- or 25-horsepower Kawasaki engine. Side-discharge/mulching decks are 52 inches, 60 inches or 72 inches. A nine-bushel BAC-VACTM catcher is optional.